Are you *A professional seeking fast results? *A student with limited budget? *A home user in need of a simple learning aid? *Self-employed with no time for formal training? *Looking for cost-effective training for your staff? *Eager to be more productive on your computer? If you've answered YES to any of the above, then this book is for you. Use it to grasp the essentials quickly and easily. 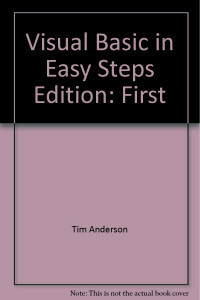 "In Easy Steps" is the leading computer books series. In concise language, easy to follow layout and "in Easy Steps, this series explains all that's important for everyday use - and more! Designed to save you time and guaranteed to give you the best value. Successfully used worldwide for self-teaching as well as an invaluable reference.